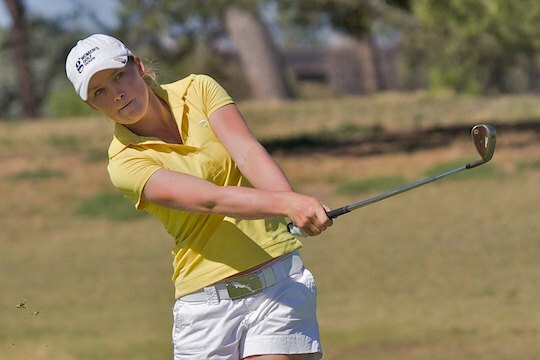 Stacey Keating’s path to Ladies European Tour professional is not one that you would expect in this modern era of children swinging a club from birth. As a young girl growing up on a farm in Cressy, south-western Victoria, netball and tennis was all country girls like Keating played. Her home town, with a population just nudging 100, didn’t even have a golf course. With her parents busy tending the sheep and crops, it was Keating’s grandparents who introduced her to golf when she was 12. They took her up the road to the bustling town of Colac. A town with a population a touch over 10,000 and more importantly, its own golf course. Hacking or not, the teenager’s talent was clearly evident. In a short space of time, with incredibly no lessons and no help, Keating was able to chop and chip her way to a handicap of 8. “I didn’t have a lesson until I was 18 when I moved to Melbourne to study at university,” the 24 year-old said in her understated way. Her first lesson was with Steven Giuliano in 2005, from the Le Brocque Golf Academy based at Sanctuary Lakes. “Once I had my lessons I just started practising. I was off a handicap of 8 when I started having lessons and then it just kept going down and down,” she said. Three years after her first lesson, Keating was holding aloft one of the world’s top amateur trophies, the Canadian Amateur in 2008 and last year she won the most prestigious title this country has to offer, The Australian Amateur Championship. The Ladies European Tour (LET) is a long way from the wheat fields of Cressy, but Keating is looking forward to the challenge – a challenge she is ultimately glad she waited for. Keating could have turned pro last year after the December 2009 LET qualifying school but her patchy finish meant she only gained conditional status. Playing every week was not guaranteed. “I didn’t think it was worth it,” she said. Keating had her most successful time as an amateur last year, securing four national ranking titles and was a member of the winning Trans Tasman Team and the Victorian side that captured the Gladys Hays Interstate Series. She also won the coveted Karrie Webb series. Her success ensured the 2010 December Q school was a much more pleasant experience. “I think I was much more prepared for it this time after having the year that I have had being able to win a few events and really feel like I was dominating,” she said. Keating finished fourth and now has a full playing card for 2011. “I am really looking forward to testing my game against the best in the world and hopefully I can do alright and never go back to tour school and never have to go through that again,” she said. With so much natural talent don’t expect to see Keating ploughing the wheat fields of Cressy any time soon.